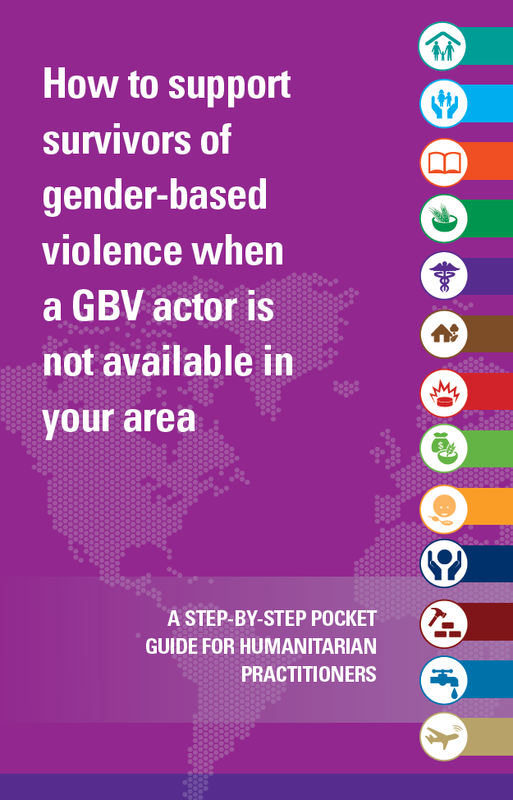 The “Pocket Guide” resource package V2.0 is a joint GBV Guidelines and GBV AoR resource designed to provide all humanitarian practitioners with concrete information on how to support a survivor of gender-based violence who disclosed to you in a context where there is no gender-based violence actor (including a referral pathway or GBV focal point) available in your area. The resource package uses global standards on providing basic support and information to survivors of GBV without doing further harm. We encourage adaptation of this resource to your local context with the support of a GBV specialist. Resource #1 - Background note and FAQs: An overview of the Pocket Guide resource package, its role as a companion resource to the IASC GBV Guidelines and key messages/talking points that can be used for advocacy and strategic communications. Resource #3 - “Pocket Guide”: A field-friendly resource for frontline practitioners in all humanitarian sectors. Includes a decision tree, do’s/don’ts, sample scripts of what to say to a survivor and more!